Capital high jumper Allan Smith has vowed to use his European Indoor Championships experience to propel him towards raising the bar at this summer’s world championships in London after finishing eighth in his first major final last night. 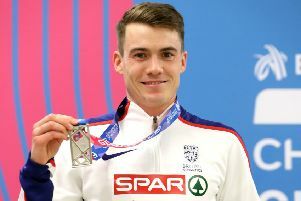 The 24-year-old from South Queensferry could only clear a disappointing 2.18 metres in Belgrade as British team-mate Robbie Grabarz landed silver behind Poland’s Sylwester Bednarek. But there is definitely more to come if he can get every element right. “The height was well there. My first attempt at 2.23m, I hit it at the very end and missed the next two by so little. I was in shape to jump high but it didn’t happen. It’s frustrating,” he said. The British team flew home from Serbia this morning with ten medals in total, equalling their previous best at the championships which will next be staged in Glasgow in 2019. Top of the tree was two golds from Perthshire’s Laura Muir who followed up her British record-breaking 1500m victory on Saturday with a brilliant 3000m triumph last night, with Eilish McColgan ending up in bronze. Pitreavie’s Eilidh Doyle spearheaded GB&NI’s push to silver in the 4x400m relay with the Edinburgh University graduate landing her tenth major championship medal. Now the Hearts supporter will look to add to the tally this summer. Asha Philip grabbed gold in the 60 metres with silvers for Shelayna Oskan-Clarke in the 800m and Lorraine Ugen in the long jump with a British record of 6.97m.